Former President Shimon Peres inaugurates new neighborhood in Haifa, Neot Peres, named after himself. Former President Shimon Peres has become one of a few leaders to have a neighborhood named after them while still alive. 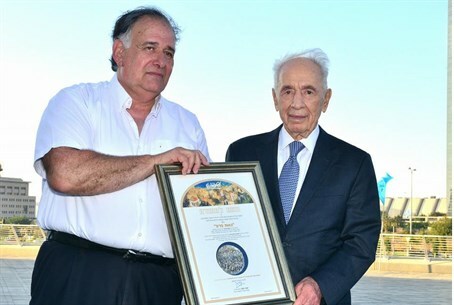 On Tuesday, Peres inaugurated a new neighborhood named after him in Haifa. The neighborhood, Neot Peres, is located in the southern part of Haifa, the third largest city in Israel. The inauguration ceremony was held at the new Sammy Ofer soccer stadium, located in the center of the new neighborhood. Around 7,000 units are expected to be built in the final phase of the neighborhood, of which 1,700 are already being built. Neot Peres will also include a high-tech park, shopping centers and the offices of the Israel Electric Corporation. “It is not often that people get have a neighborhood called in their name while still alive," said Haifa Mayor Yona Yahav during Tuesday’s ceremony. "When I try to imagine the new history of Zionism without Shimon Peres - the first thing I think of is that I do not want to imagine our history without Shimon Peres,” he continued. "There are very few leaders that one can use big words such as revival, building, renewal and the Land of Israel when describing their personality and public image. I cannot think of one more public figure in Israel today, whose presence is needed in our public space as much as Peres,” said Yahav. Peres stepped down in July, when current president Reuven Rivlin assumed his post. Since that time, he has managed to anger a few people even while out of office. A youth goodwill soccer match between Israelis and Arab residents of Judea that Peres and his Center organized evoked outrage from the Palestinian Authority (PA), including a campaign to track down the Arab organizers, and even condemnation as a "crime against humanity." In another incident which occurred during Israel’s Operation Protective Edge in Gaza, Peres evoked outrage when he said that it was time to end the operation. Peres, who visited wounded soldiers at the Soroka Hospital in Be’er Sheva, said that "the war has run its course and now we need to find a way to stop it." Most recently, the Peres Center for Peace released a light-hearted video, written by Peres's granddaughter, showing the former president “looking for a job”.